1729 S. Charles Street. By Lisa Doyle. Four generations of the Lowe and Martin Centennial Family have passed through the front door opening of the two story, two bay wide, red brick Federal style rowhouse at 1729 S. Charles Street, in South Federal Hill. At first glance, this house seems to be like any of the other well-kept homes on the block. It is hard to imagine that for over one-hundred years, this house and family have been an anchor in the neighborhood, steadily watching other families come and go. It is time to honor the Lowe and Martin family with a well-earned title of being a Baltimore City Centennial Homes Family of South Federal Hill. Carol Martin, one of the present owners, decided that she needed to share the extraordinary story of the familyʼs connection to her rowhouse built just after the Civil War. She especially wanted to honor Mary Joyner Lowe, who settled with her family in the same South Baltimore neighborhood rowhouse in 1894. 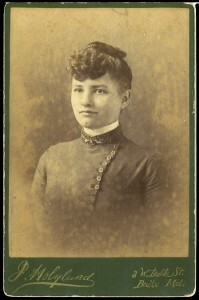 Mary Joyner Lowe was Carolʼs mother-in-law from her first marriage to Harry Warren Lowe. Even before she was related by marriage to the Lowe family, Carol Martin had felt a very strong connection to the neighborhood. 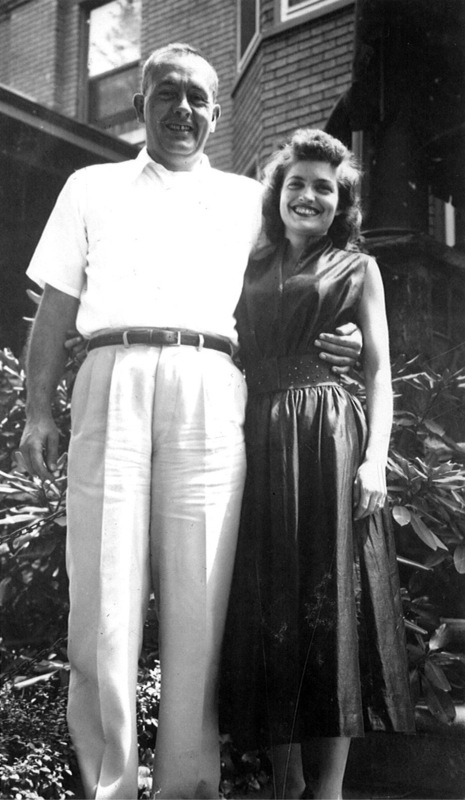 She recalls back in 1953, when her then boyfriend and later first husband, Harry Warren Lowe, (known by all as Warren Lowe) took her to meet his mother. 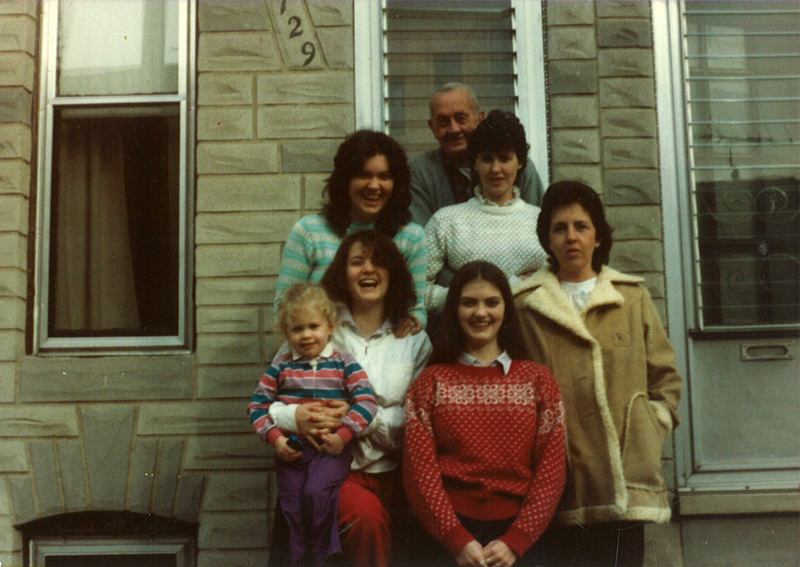 “The moment I entered the neighborhood, I loved the block and wished even from that first day that I could live there,” she said.Carol wanted the younger generation of her family to have an understanding of the struggles and strengths these relatives lived through while raising their family. As a result of the family’s close ties many accomplishments, joys and laughter were connected to this location over so much time. The family story begins when Thomas and Gertrude Lowe, ventured from England to America with South Baltimore as their final destination in 1884. They travelled with their three children, Gertrude, Elizabeth and Arthur, often called “Otts”, who was twelve years old at the time. Like multitudes of other immigrants arriving from Europe, their ship presumably landed at the piers built by B&O at Locust Point. Thomas Lowe, a Methodist Reverend, started the Loweʼs Methodist Church on William Street in South Baltimore in a tent. Some years later a church was built, which Carol Martin recalls she attended with Warren Lowe in the early years of their marriage. This building was turned into a condominium in the 1970s. As a young man Arthur, attended his fatherʼs church and most likely it was there that he met, Mary Joyner, who had grown up on a farm on the Eastern Shore of Maryland and had moved to South Baltimoreʼs Montgomery St. to find work. Mary and Arthur were married, and by the time their first son, Thomas Ernest was two years old, they moved into 1729 S. Charles Street. The couple had six births and one still-birth in the house. The most devastating tragedy to affect the entire Lowe family occurred in 1920 when Arthur Lowe suffered a head injury from a head on collision on the Hanover Street Bridge. He was treated and sent home shortly after the accident. As his condition worsened, he was taken to the South Baltimore Hospital on Light Street and later died. The hospital is no longer on Light Street, it was relocated in 1968 to S. Hanover Street. Today it is known as Harbor Hospital. Mary Lowe remained a widow the rest of her life. Harry Warren Lowe, born in 1915, was the youngest of the six Lowe children who was only five years old when his father died. He enlisted in the Army in 1939 at the age of 24 and served as a Private First Class. His Infantry was deployed right after the Invasion of Normandy on June 6, 1944. He and his first wife, Mary Emerson, lived at 1729 S. Charles St., with their first daughter, Mary Warren, for a couple of years after Warren returned from WWII. He returned to the Army in 1950 during the Korean War to serve as a Military Police Technical Sergeant Overseas. During his service in Germany, his second daughter, Margaret, was born. Unfortunately, he never saw this child until she was four years old and by then, he was no longer married to her mother. 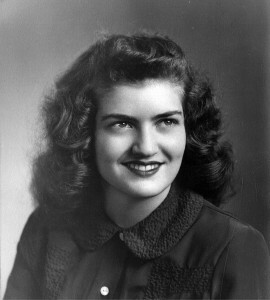 Warren was discharged from the Army in 1952, with nine years of service. Carol Martin, born Carol Meisenhelder, was born in St. Louis, Missouri, and raised most of her life in York, Pennsylvania where she studied dance and acrobatics from the age of five to adult. After high school, she attended the Dramatic Art and Radio School, on Charles Street in Baltimore, no longer in existence. Carol returned to York and attended The Powell Business School, which prepared her for a job she got at the B&O Railroad when she moved back to Baltimore. Carol studied with The Fred Astaire Studios in Baltimore and often performed on television. She danced with a show troupe organized by the railroad employees that was accompanied by the Joe Dowling Orchestra, which was very popular in the Baltimore area during the 1950s. She also danced with a show troupe that performed for Air Force Bases in Florida, New York and the Bahamas. By the time Carol and Warren started their family, Warrenʼs mother, Mary Lowe, was in her eighties and went to live with her daughter, Phyllis, in West Baltimore, but she returned often to visit and stayed overnight at 1729 S. Charles Street. Carol fondly recalls many long conversations about many subjects with the elderly Mary Lowe. Mary told Carol that she had worked at the YMCA at Riverside Park, where crews that ran the railroad often stayed. She also rented rooms for extra income several years after her husband died, from the 1930s to the 1950s. One boarder was a retired sea captain who rented the front bedroom. In one of their chats, Carol asked Mary what year the house was built. Mary said that after moving into the house in 1894, she had asked the same question to a man who had done some repairs on a ceiling that was falling down in her house. He told her that the houses on her block were about thirty years old, which at the time would have indicated that they were built shortly after the Civil War around 1865. Mary Lowe also told Carol of how she had first installed gaslights and later replaced them with electric lights. She had also put the first match lit hot water heater and coal-burning furnace in the house. Another great renovation she made was to close off a porch on the second floor in the back of the house, to create the first bathroom in the house as a replacement for the outhouse. 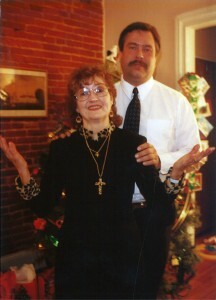 Mary Loweʼs home was always a safe harbor in the neighborhood that many neighbors relied on when times were difficult. Carol recalls that when she dated Warren she witnessed how teenage neighbors arguing with their families or coming home late always knew they could knock on Mary Loweʼs door, to find understanding, as well as a place to sleep for a night if needed. 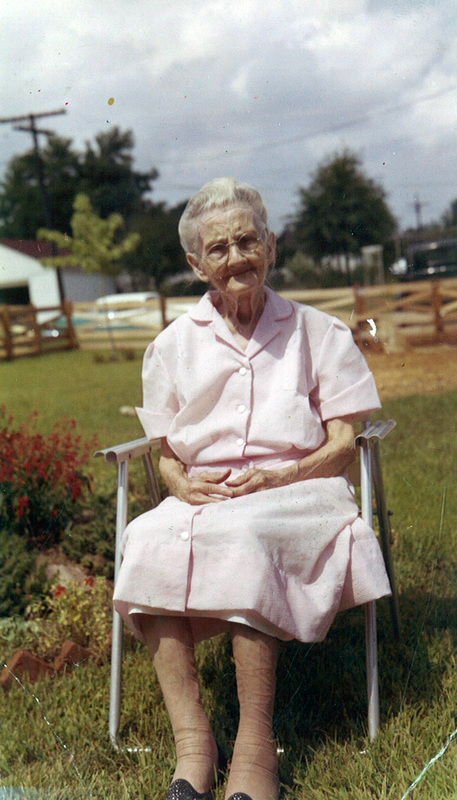 Mary Lowe only lived long enough to see the oldest of Carol and Warrenʼs daughterʼs, Lucinda, reach the age of 14 months. On April 1, 1960, on her 88th birthday, Mary Lowe died of a heart attack. The property was left to the two surviving heirs, Warren and Phyllis. 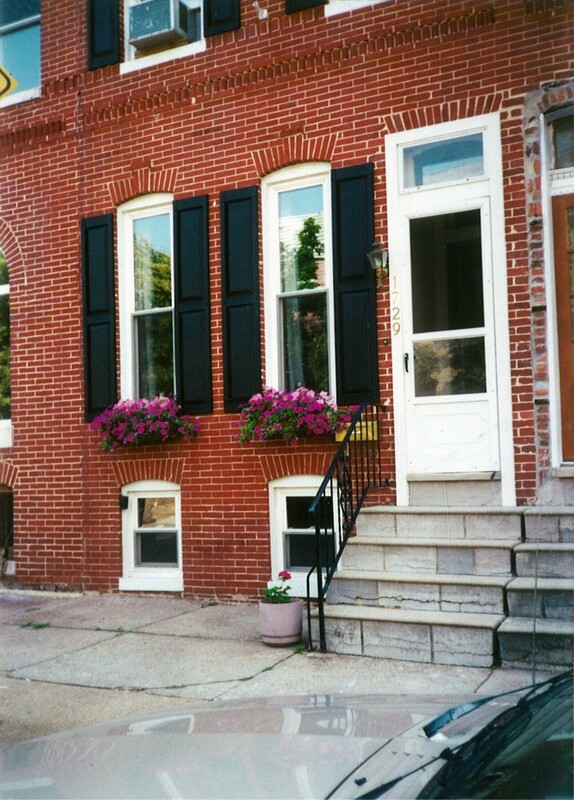 Warren and Carol purchased Phyllis Lowe Mitchell’s part of the house and became sole owners of 1729 S. Charles Street. Harry Warren Lowe with daughters and a grandchild in front of 1729 S. Charles Street. The three daughters gave Carol and Warren a total of 14 grandchildren, some of the children lived their early years in the house with their parents and their grandparents. Two grandsons, Jordan and Joshua knew the house as their home for the first years of their life. According to Carol, both grandsons feel very strong ties to the house. Jordan and his girl friend, are presently living with Carol and her second husband, Craig Martin, in the house. Joshua, studies nearby at UMBC and stays overnight when he has late night classes during the week. 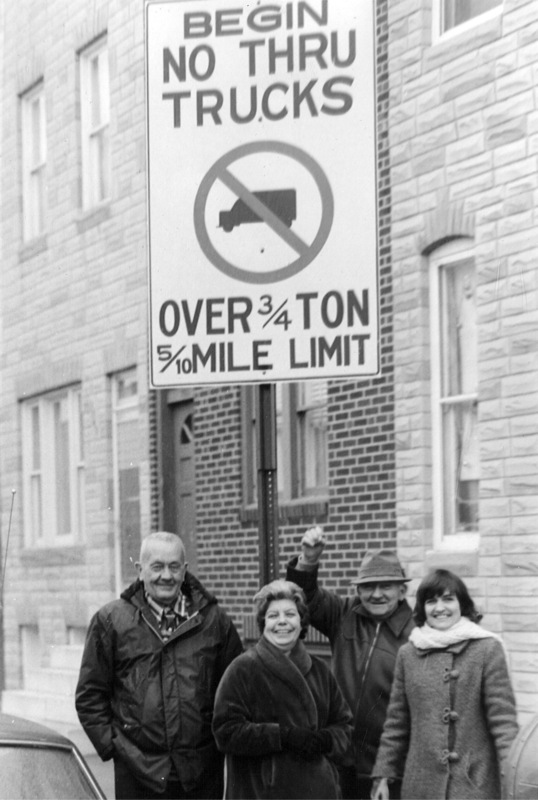 On a Saturday in August of 1975, two rowhouses in South Federal Hill collapsed on each other asa result of the repeated vibration from large vehicles driving down the neighborhood streets over many years. The vibration from a bus driving down Heath Street, caused the mortar from the two buildings to crack and loosen the bricks to the point where the bricks came flying out of the walls. A neighborhood organization called the Coalition of Peninsula Organization, COPO, approached Carol and Warren Lowe and many other concerned neighbors on the block with the idea to start an organization to prevent further destruction from happening to other homes on the block. 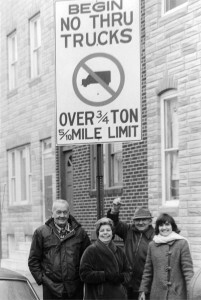 Harry Warren Lowe on far left, SBIC members in center, and Carol Lowe on far right, all sanding under sign erected as a result of their advocacy. Courtesy of Carol Martin. Warren named the organization the South Baltimore Improvement Committee, SBIC, and the members asked Carol to be their first chairperson. The SBIC approached many city and government offices such as, Maryland Transportation Authority and Public Works, (today, the City Traffic Department) to request changes to protect their neighborhood buildings from further destruction. In time, they got new regulations and signs to re-route heavy traffic and buses from entering the neighborhood, as well as a blinking light at Barney and Charles Streets where there were numerous accidents; sometimes two in a single day. The organization also re-routed the buses to transit east on Wells St. and North on Light St. SBIC was also successful in getting Wells St. extended from Charles St. to Hanover. Other improvements they attained were, low-income rehabilitation grants for residents that qualified. These grants also helped rehabilitate the two vacant houses adjacent to the collapsed building on Heath and Charles St., that started the entire neighborhood advocacy. SBIC also helped locate absentee landlords and took them to court in hopes that the City of Baltimore would purchase the properties for Section 8 Housing. The benefits of these community efforts are still evident today in the posted signs, a new road and improvements to deteriorating buildings. The neighborhood advocacy work lead Carol to a new job from 1976 to 1982, as a secretary and resource person at the Mayorʼs Station on Wall Street in Baltimore. In 1967, during Mayor Thomas D’Alesandro’s administration, the City Council President, William Donald Schaefer, began to establish Mayor’s Stations to improve delivery of city services. As Mayor of Baltimore from 1971, William Donald Schaefer set up many of these stations throughout the city neighborhoods, and the employees were referred to as, “Donald’s Ducks.” In 1990, (before South Federal Hill was listed as a Historic District in 2003) Carol gutted all the walls in the house, put up sheet rock and painted the interior walls. Shortly after these renovations took place, Harry Warren Lowe, who had been ill for a long time died, on November 19, 1991 at Union Memorial Hospital, at the age of 76. Just before Carol retired from working with the CSX Railroad, she decided to go to massage therapy school. After becoming certified, she worked in the field for some time and shortly thereafter, married Craig Martin in 1998. Craig Martin has been essential to the changes in the house in the last twelve years including a new bathroom, extending and redesigning the kitchen, and adding an outside deck. He previously owned two houses in the South Baltimore area; one in Federal Hill and another in South Federal Hill for the last twenty-two years. The block Carol and Craig live on now has only two families remaining from many years ago. The neighborhood has changed as younger people are moving into the area. The experiences of these two strong female owners have been similar in many ways: working, raising children, welcoming grandchildren, caring about neighbors and changing the house to accommodate the family growth. After a lifetime of working in the City of Baltimore, growing the Lowe family, advocating for her neighborhood with Warren Lowe and creating another family with Craig Martin, Carol Martin, although raised in Pennsylvania, feels her roots are in Baltimore and in her house. Mary Lowe, raised on Maryland’s Eastern Shore also found herself rooted to Baltimore and the same house, having to raise six children on her own as a young widow and loving the house that provided extra income for her family during difficult economic times and shelter throughout the years. Both women somehow were able to always keep family and friends returning to their home and loving their place. The sense of warmth and comfort that the space within the walls offered Arthur and Mary Lowe, back in 1894, seems to have been passed from Mary Lowe on to her daughter-in-law, Carol Lowe Martin. This intangible sense of place and pride radiates from Carol today and is starting to affect her grandchildren too. Hopefully, this flame will be passed on to another generation of this Centennial Family.